Few weeks after fulfilling his promise to Mavin Boss Don Jazzy, controversial designer Alexander Amosu has shipped another bottle of expensive Gout de diamants sparkling wine to Peter Okoye of P-Square. The wine named Taste of Diamonds that costs a whopping 1.2m pounds, an equivalent of 300 million naira has been a source of controversy among Nigerians at home and abroad. 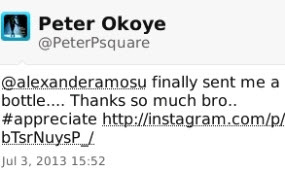 @PeterPsquare as promised!!! 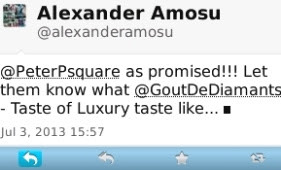 let them know what @goutdediamants taste of luxury taste like. So what is Amosu trying to prove to the world? U pple have nothing to do with money….. Just remember the rich and d poor are nt equal bt one thing makes them equal …….(death)…. Can somebody tell me more about this drink , please I am glueless about this drink that cost a fortune. @jumaaat, you are right because as i speak to you i have nothing to eat tonight, they should try and remmenber we ness previlage for ones. Ojb is there suffering of 15million Nair only, You’re there drinking yeye wine….Godiswatchingyou…Gbam! And so what,let them spend all their money on water and sugar with some alcohol but they should remember that what profit a man to gain the world and loss his soul. Hello my fellow Nigerians,don’t allow all dis devilish pple to mislead u,all dis things dere showing here is a lie oh,just imagine what dey are saying 1.2m pounds on just 1 bottle of alcoholic,world richest self never dream of such talk less of just ordinary local musician,just come over to qatar and see how small kids spend big money,peter u better watch ur back..//..
Ooooh boy u no try ooooooo…….. Y u no bring d money for me na???? I can’t imagine ordinary water and sugar 2 cost a whopping sum amount of money in Dollars, Pounds n Naira! D secret behind dis satanic Champagne is yet 2 b revealed! Lets b watching, God dey!! Who eva tasted or drinketh 4rm dat bottle shall neva die again (as there 4father did)….. Dont u knowwwwww????????? SMH! Posing with the champagne only makes you look immature and silly. Its a lie no wine ever cost like that in UK.they were fooling u people not me that have travel many countries. nonsence fouls 2baba can not do dis. With a glass of the wine, one will live forever. You be fool and that’s your opinion is different from every other person. Or may i say you are stylishly begging for arm. guyz u din’t get the gist,p square din’t pay for the drink alexander ship in d drink for him after peter told him dat the drink will not chop his money cos he now care…! Vanity, e no make sense. vanity is meant 4 man… If u see it as vanity, Y do u hustle 2 mk more money… Y not live on stipends? C it in dis light… Dey hv worked hard 2 mk money – u rmmba seeing diz guyz sing bizzy body n senorita.. Dey wia not lyk dis, dey worked hard 4 dia money… Wont he enjoy his money on wat he wants now dat he has it? Read carefully before u coment n remember thou shall not jugde. Na lie joor…. im no get dt kind moni…. na pose im jst dey pose…. dem go snd am bk 2 d owna… mek im show us wia im open if im get mind…..
Well, I read different comment based on pic on champagne, I will like to use this medium to say, Mr. Okoye (P Square) pls with due respect I need your help related to family needs help me. 08067305062. Thank u once again. 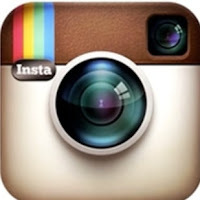 …Can’t ßelive this… PETER_!!!. You are a disappointment if dis is true..
300million Naira just on water mixed wit all sort of nonsense???. Honestly, am Speechless. 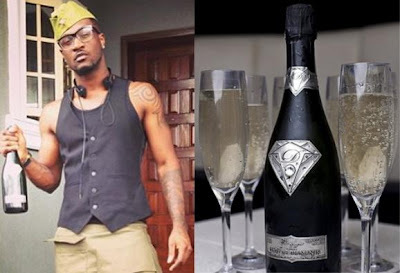 P-square peter okoye gets own bottle of 1.2million pounds wine from::::::———–> (alexander amosu) Pls read it very well b4 commenting. I heard that P-Square’s new Home cost N400,000,000; So how can Peter of P-Square bought just a drink which cost N300,000,000. Their Mom passed away few Months back. Micheal Jackson, 50Cent, Rihanna & Beyonce are richer than P-Square, & non of them has bought such Drink. There is no wealthy person who works hard to make his or her money will even think of such Drink, except if the person is a member of Illuminiaty. Just tell me how much do you even think P-Square is making in this Local Music? U guys should leave Peter alone. The Guy said the wine was a gift from Alexander Amosu. He was only acknowledging a kind gesture by showing off. You all should get a life. There is more to a mam than just the man you know.